If nothing else, Slow Burning Lights will officially put Blue Sky Black Death above their contemporaries. 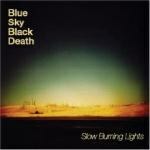 If nothing else, Slow Burning Lights will officially put Blue Sky Black Death above their contemporaries. Kingston and Young God, the duo that makes up BSBD, have been steadily earning respect throughout the hip-hop community for their phenomenal albums featuring a slew of underground emcees and vocalists. But for their latest, BSBD put the rappers to the side and set their sights on crafting something that can only be described as otherworldly. Slow Burning Lights is like one part Telefon Tel Aviv, one part Cocteau Twins, and one part -- and this is a big one -- Blue Sky Black Death. In other words, the 10 tracks on here have a combination of dreamy textures over sometimes erratic, glitchy drums with that traditional BSBD quality that is almost impossible to categorize. The gorgeous instrumentals are paired with newcomer Yes Alexander, whose ethereal vocals match BSBD's ghostly production perfectly. Cinematic might be a term that has been beaten to death, but it absolutely applies here. The soundscapes are thrilling as they build and create a dreamy aura around Alexander's voice, which is akin to that of Shara Worden and Hope Sandoval. In short, Slow Burning Lights is simply a must listen for everyone: from hip-hop heads interested in the latest effort from their favorite producers to dream-pop fans looking for something fresh.